The biggest benefit of Eumers tube fly vice is that the user can tighten the tube fly to prevent undesired rotation of the fly. 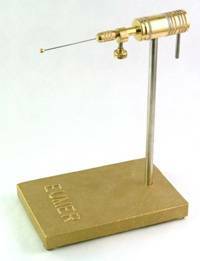 This Eumer vice comes with a heavy, sturdy base as well as a table clamp for clamping onto other flat surfaces anywhere. The tube fly vice also includes different tying pins (3 different thicknesses). The vice has very good rotation to give a good visual view of the fly being tied and for example attaching hackles.